Six days to go. My excitement is only matched by the feeling of being unprepared, despite nearly a year of preparation. There have been a few minor concessions to modernity as I’ve prepared the bike for the trip – all 800 to 900 miles of it, depending how much I get lost. Here’s the technical stuff. When I bought the Thanet Silverlight it had a single, fixed gear, as originally manufactured. The maker, Les Cassell, used to recommend that the bike was supplied with a single fixed sprocket, like mine, or a 4-speed Sturmey Archer hub. Over the last year, I’ve had a couple of wheels built up with Sturmey Archer hubs, one with an FC close ration hub and the other a wide-ratio FW type. By putting a larger sprocket (22-tooth) onto the 1949 FW, to complement the original Williams 48-tooth chain ring, I’ve managed to have the gearing lowered to match the capabilities of 60-year old knees. At about 20 mph the cranks are spinning freely but, apart from when coasting downhills, I don’t want to ride any faster than that. Having lower gears for the big climbs is more important on this trip. I don’t need to get anywhere fast, but I do need to get back. 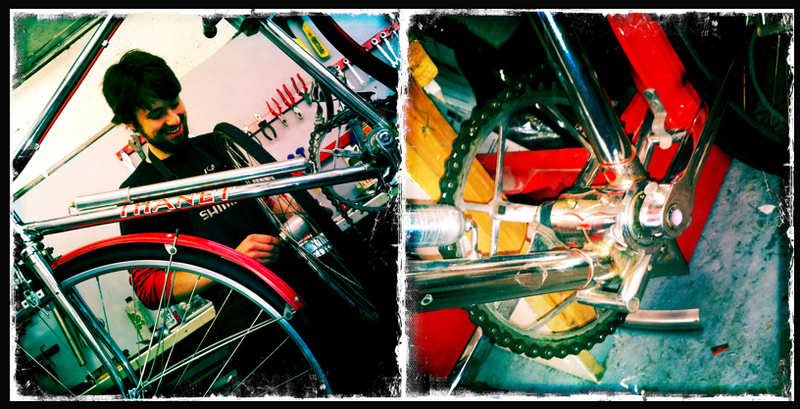 Ben Abbots checks out a 1949 Sturmey Archer hub for the Thanet in John’s Bikes, Bath – not a trace of carbon fibre in sight! I’ve changed the stem for a longer one (a Nitto) because the original was too short and the weight distribution on the bike meant it had a tendency to shimmy. (If you’ve never experienced shimmy, take a look at this. It’s always frightening, and can be fatal!) The longer stem improved the situation and adding a small handlebar bag, plus a small Carradice bag fixed to the seat post, seems to have made the bike much more stable. The only other modifications were to replace the brake blocks with longer mountain bike versions, the addition of lightweight pedals and strapless toeclips (a friend’s recent accident has made me wary of being strapped onto pedals – the leg break was very nasty! ), and the use of relatively modern luggage, plus a Garmin Edge 200 GPS – just for tracking mileage and average speed. Throughout the year of bike preparation, the help and advice I’ve had from Ben Abbots, a music student and qualified bike mechanic who works part time at John’s Bikes in Bath, has been invaluable. As a young bloke, Ben’s knowledge of, and enthusiasm for, vintage bikes is astonishing and he’s tackled every task on the Thanet with real commitment. I’m not sure this trip would be possible at all if it had not been for his help.